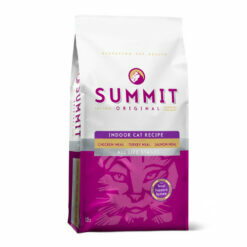 SUMMIT™ Original recipes are created with an epicurean’s knowledge of how to source the best and most appropriate ingredients that a healthy pet needs, without compromising that delicious taste. SUMMIT™ Original recipes provide your pet with a balanced diet of meat, vegetables and omega oils; with zero beef, wheat, corn or soy. Zero added growth hormones, zero by-product meals or artificial preservatives.